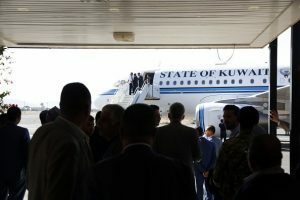 The delegation of the legitimate government arrived in Sweden to attend peace talks starting on Thursday with members of the Iran-aligned Houthi militia, in a renewed UN push to end a war that has pushed the country to the brink of starvation. A 12-member government delegation, led by Yemeni Foreign Minister Khaled Al Yamani, arrived in Stockholm on Wednesday evening, one day after a rebel delegation flew in from Sanaa — accompanied by the UN envoy. The talks mark the first meeting between Yemen’s Saudi-backed government and Houthi rebels, linked to Iran, since 2016, when 106 days of negotiations yielded no breakthrough. A UN source said the two sides were unlikely to hold direct talks at a renovated castle outside Stockholm and that special envoy Martin Griffiths and his team would shuttle between them for the consultations, the first since 2016. One representative of the internationally recognised government, Abdullah Al Alimi, tweeted that the talks were “a true opportunity for peace,” before the delegation flew out of the Saudi capital Riyadh on Wednesday. Seeking to reinvigorate peace efforts, UN special envoy Martin Griffiths secured some confidence-building measures, including the evacuation of Houthi wounded, to help persuade the movement to attend the talks in Sweden. “If the consultations proceed positively, we will see an immediate change for people in Yemen. We will see fewer people hit by and fleeing violence, fewer people pushed to the most desperate means of staying alive,” said Mohamed Abdi, Yemen country director for the Norwegian Refugee Council. “Equally, if the consultations fail, or stall, so too will hopes of halting Yemen’s steady descent into hell,” he said in a statement. The Sweden meeting follows two major confidence-boosting gestures between the warring parties — a prisoner swap deal and the evacuation of 50 wounded insurgents from the rebel-held capital for treatment in neutral Oman. The UN envoy is seeking agreement on reopening Sanaa airport, swapping prisoners and securing a truce in the Houthi-held port of Hodeidah, now a focus of the war. This could lead to a wider ceasefire that would halt air strikes and Houthi missile attacks on Saudi cities.